I am trying to back track as you can see. I am going back to all the stuff I did not post when I should have. 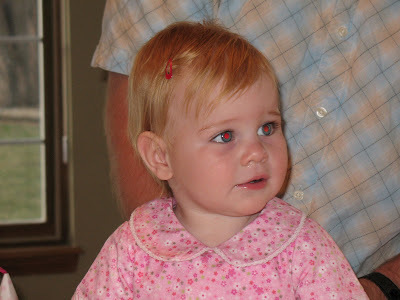 This is a picture of Courtney on her first birthday. We had a simple little party and invited only the Morris Family and Lane Family. It was so nice to stand around and stare at our sweet beautiful little girl. She was eating up the attention and putting on quite the show for us. She loved the Cold stone Creamery Cake I got her and enjoyed opening her gifts. She was so pretty in pink!! wow march 12th 5:00pm. she is such a joy. Oh how sweet. You're so lucky your hubby gave you four babies! Oh she is such a dolly! I just want to pick her up and put her in my pocket! I know what you mean about catching up...I do it all the time. I can't believe your baby is 1 already. You have a gorgeous family. She's totally adorable.